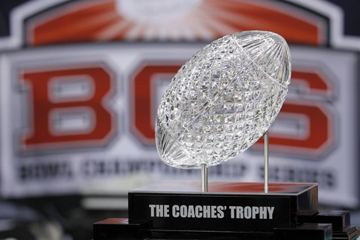 A committee of university presidents approved a plan for a four-team college football playoff, starting in 2014. Here’s what you need to know about the new postseason format put together by the commissioners of the 11 major college football conferences and Notre Dame’s athletic director. HOW WILL THE TEAMS BE CHOSEN? A selection committee will pick the four teams after the regular season, using guidelines such as strength of schedule, head-to-head results and won-loss record, while giving conference champions preference. The makeup of the committee is to be determined, but it likely will be about 20 conference commissioners and college athletic directors. WHERE WILL THE GAMES BE PLAYED? The two semifinals will rotate among six sites. The current BCS games are the Rose Bowl (Pasadena, Calif.), Sugar Bowl (New Orleans), Fiesta Bowl (Glendale, Ariz.) and Orange Bowl (Miami). The Cotton Bowl, now played at Cowboys Stadium in Arlington, Texas, has to be considered a front-runner to land one of the other two spots. Candidates for the other one? Try Atlanta and Jacksonville, Fla. The championship game will become college football's Super Bowl. Any city can bid on it, even ones that host the semifinals and those that have not been traditional bowl sites. Expect most to be played in dome stadiums or at warm-weather sites. WHEN WILL THE GAMES BE PLAYED? The semifinals will be played on Dec. 31 and/or Jan. 1. College football used to own New Year’s Day. The Bowl Championship Series got away from that. The leaders of the sport want to reclaim that day. The championship game will always be played on the first Monday in January that is at least six days after the semifinals. The first “Championship Monday” is Jan. 12, 2015. WILL THIS PUT AN END TO THE CONTROVERSY? No. Doubling the field from two teams to four alleviates some of the problems that the Bowl Championship Series couldn't solve. There will still be plenty of complaining, but it will come from teams No. 5, 6 and 7, instead of Nos. 3 and 4. That's better. The further down you go in the rankings, the weaker the arguments get for inclusion. But there are plenty of people out there now that believe four is not nearly enough. In short the five power conferences (SEC, Big Ten, Big 12, ACC and Pac-12) will get more than the others. The Big East no longer will get a big share, but how much smaller will it be? 1) They don’t want to deal with this every four years the way they have been. 2) It keeps the playoff from expanding for 12 years. WILL IT GROW EVENTUALLY? No doubt. It will be successful, so why not have more of a good thing. Also, many if not all of the people who put this format together will have moved on when it's time to come up with another plan. College football is moving away from the current bowl system, in which it farms out its postseason to third parties. As a new structure evolves and conferences continue to realign, there is no reason to think the playoff will continue to have only four teams.